237 Marlborough is located on the north side of Marlborough, between Exeter and Fairfield, with 235 Marlborough to the east and 239 Marlborough to the west. 237 Marlborough was built ca. 1876 for building contractor George Wheatland, Jr., one of four contiguous houses (233-235-237-239 Marlborough), designed as two sets of symmetrical pairs. In his Houses of Boston’s Back Bay, Bainbridge Bunting indicates that these houses were built ca. 1874. However, they do not appear on the 1874 Hopkins map, and based on references to them in advertisements and deeds, it appears that they were completed in late 1876. 233-235-237-239 Marlborough were built on the eastern 66.67 feet of a 75 foot wide parcel of land that George Wheatland, Jr., purchased as three 25 foot lots at the Commonwealth of Massachusetts’s public sale on March 2, 1872. On May 3, 1873, he transferred the Commonwealth’s bonds securing his right to purchase the lots to Eben Dyer Jordan and Charles Marsh, co-partners in the dry goods firm of Jordan, Marsh & Co. On November 25, 1876, after the houses were built, they transferred the bonds back to him, and on November 28, 1876, he purchased the land from the Commonwealth. Click here for an index to the deeds for 237 Marlborough. None of the four houses sold, and on February 28, 1877, George Wheatland, Jr., transferred the 75 foot lot and “four new dwelling houses thereon” back to Eben D. Jordan and Charles Marsh. 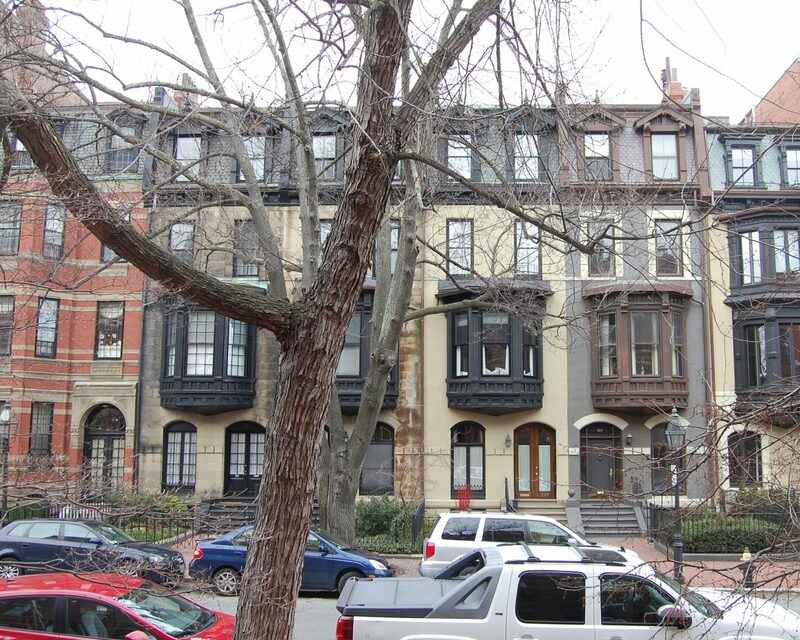 They sold the houses between September of 1878 and January of 1881, and in September of 1881 sold the remaining 8.33 foot lot to the west to real estate dealer Samuel Horatio Whitwell. 237 Marlborough was not listed in the 1876-1878 Blue Books. On November 1, 1878, 237 Marlborough was purchased from Eben D. Jordan and Charles Marsh by attorney Darwin Erastus Ware. He and his wife, Adelaide Frances (Dickey) Ware, made t their home. They previously had lived at 113 Warren. Adelaide Ware’s sister, Alice M. Dickey, lived with them. She was a teacher at the Prince School (northwest corner of Newbury and Exeter). 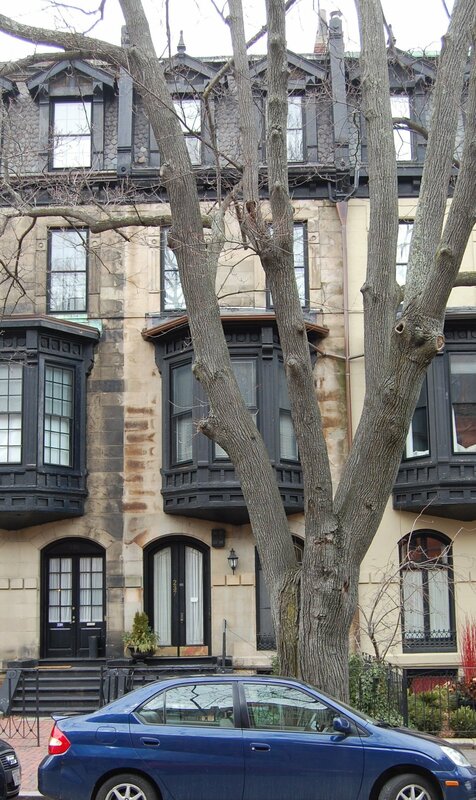 She continued to live with them in 1889, but had moved thereafter to 5 Irvington. Darwin Ware died in April of 1897. Adelaide Ware continued to live at 237 Marlborough with their son, Richard Darwin Ware, an attorney. 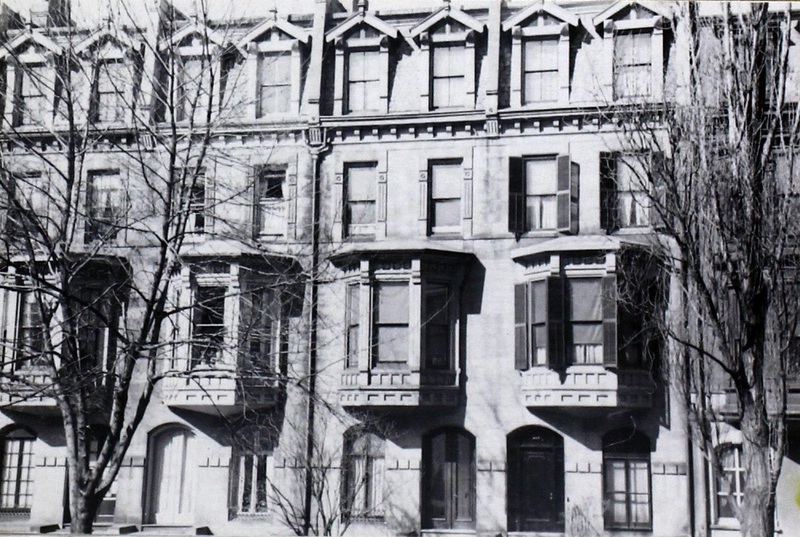 From about 1904, Dr. Henry Melville Chase, Jr., a physician, and his wife, Blanche (Knox) Chase, were boarders at 237 Marlborough. Dr. Chase maintained his medical offices at 308 Marlborough, where they also had lived in 1903. 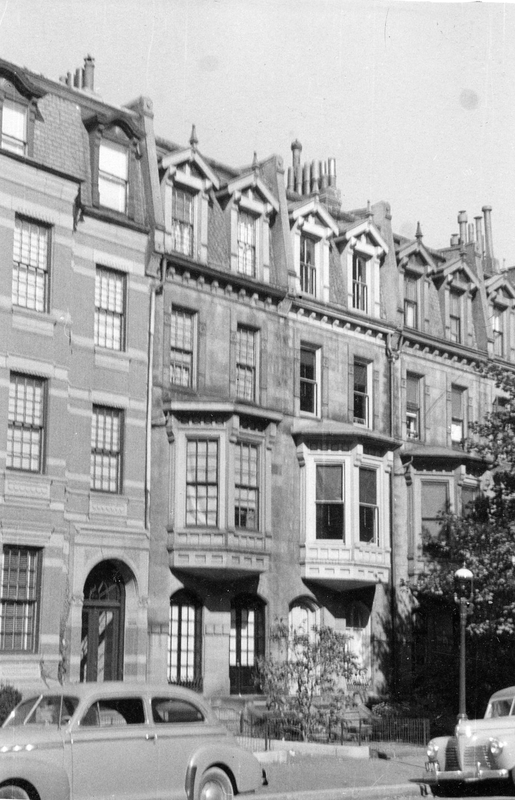 They continued to live at 237 Marlborough until about 1907, but by 1908 they were living (and he maintained his medical office) at 409 Marlborough. Richard Ware married in November of 1905 to Margaret Josephine Whitman and they moved to an apartment at 138 Marlborough. Adelaide Ware continued to live at 237 Marlborough in 1910. 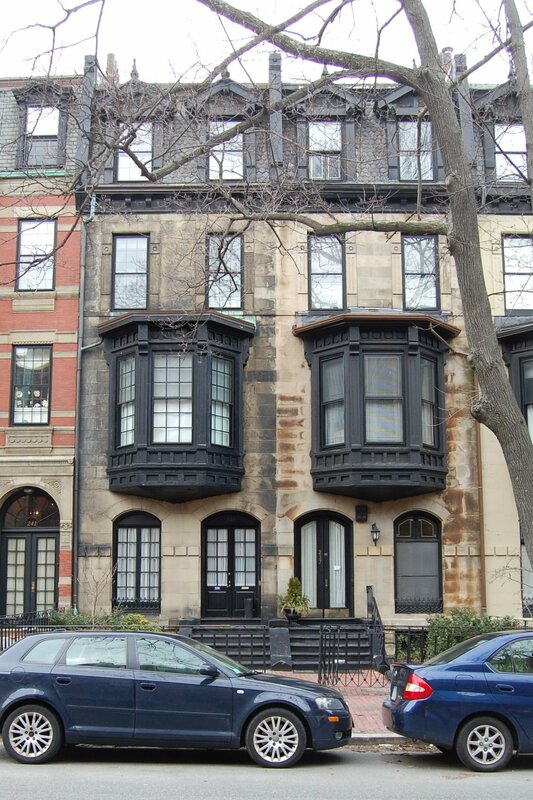 By the 1910-1911 winter season, she had moved to 138 Marlborough, either to live with her son and daughter-in-law or in an another apartment in the building. 237 Marlborough continued to be owned by the Ware family and leased to others. The house was not listed in the 1911 and 1912 Blue Books. By the 1912-1913 winter season, it was the home and medical office of Dr. Frederick Stanford Burns, a physician and professor at Harvard Medical School, and his wife, Josephine (Boynton) Burns. They previously had lived in an apartment at 224 Marlborough. They also maintained a home in Norwell. Richard and Margaret Ware divorced in about 1913 and he married again in September of 1914 to Emily Josephine Ludla. Adelaide Ware died in 1924. Richard and Emily Ware divorced in 1926 and on November 26, 1926, he transferred 237 Marlborough to himself as trustee for her benefit and the benefit of their daughter, Elizabeth A. Ware. The Burnses continued to live at 237 Marlborough during the 1928-1929 season, but moved thereafter to 83 Marlborough. 237 Marlborough was not listed in the 1930 Blue Book. On July 1, 1930, 237 Marlborough was purchased from Richard Ware by shoe manufacturer Henry Glenn Powning. He and his wife, Josephine (Stout) Soulé Powning, made ot their home. They previously had lived at 231 Marlborough. They also maintained a home in Manchester. They continued to live at 237 Marlborough until about 1942. In 1943, 237 Marlborough was the home of Richard Bartram Boyd Tollinton and his wife, Mary Judith Paulina (Dowdall) Tollinton. He was the acting British Consul in Boston. They had lived in an apartment at 280 Beacon in 1942. By 1944, 237 Marlborough was the home of Kimball A. Loring and his wife, Helen (Purnell) Loring. They previously had lived in Reading. Kimball Loring was president of the Machine Composition Company, a typesetting company founded by his father, Charles A. Loring. They moved to 98 Pinckney in 1945. On September 13, 1944, 237 Marlborough was purchased from Henry Powning by Donald K. Woodward and his wife, Dorothy Woodward. On May 7, 1945, 237 Marlborough was purchased from the Woodwards by Nathaniel McDonald Mitchell. In October of 1945, he married Mrs. Edna (Rowell) Fisher and they made it their home. He was president of Barnes Textile Associates, Inc. In September of 1948, he filed for (and subsequently received) permission to construct a one-car garage at the rear of the property. They continued to live there in 1953. On June 24, 1954, 237 Marlborough was purchased from Nathaniel Mitchell by Kent Whitman and his wife, Dorothy Ann (Jackson) Whitman. They previously had lived in an apartment at 476 Beacon. He was an employee of Liberty Mutual Insurance. He died January of 1964 and Dorothy Whitman moved thereafter. On April 27, 1964, 237 Marlborough was purchased from Dorothy Whitman by James G. Mead. He and his wife, Pauline D. Mead, made it their home. In 1966, he was a securities analyst for Loomis Sayles. They continued to live there in 1967. 237 Marlborough was shown as vacant in the 1968 and 1969 City Directories, but by 1970, it was once again the home of James Mead, who by that time had become manager of Mithril Inc, an investments firm. Pauline Mead was no longer listed with him in the City Directory. On March 1, 1972, 237 Marlborough was purchased from James Mead by Daniel G. Udelson, a professor of aerospace and mechanical engineering at Boston University. He and his wife, Mary Ellen (Messina) Udelson, made it their home. On July 19, 2012, Daniel Udelson transferred his interest in 237 Marlborough to his wife, and on the same day she transferred the property to their children, John D. Udelson and Christina A. (Udelson) Knopp, the wife of Kevin Knopp, as trustees of the Mary Ellen M. Udelson 2012 Revocable trust. On August 22, 2014, they transferred the property to the 237 Marlborough Street LLC, of which they were the authorized signatories. Daniel Udelson died in March of 2015. 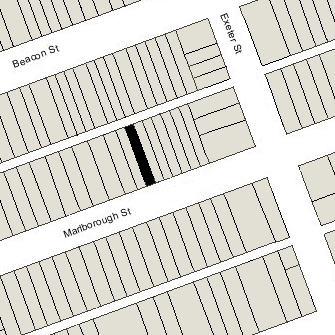 On December 21, 2016, 237 Marlborough was purchased from the 237 Marlborough Street LLC by the 237 Marlborough LLC (David J. Watson and Arris Development LLC, authorized signatories). It renovated the property and converted it into a single-family dwelling.